Dolls, to the left feast your eyes upon Stella McCartney’s fabulous Falabella Small Chain-Trimmed Bag – the very same one seen upon the arm of Kim Kardashian, Jennifer Lopez, Kate Hudson, Kate Walsh, Diane Kruger, and Ms. Stella McCartney herself; to the right take a gander at Spiegel’s saucy Foldover Bag with Chains. While the Spiegel stunner harbors a snap closure, as opposed to the magnetic opening of the magnificent McCartney; for a mere $49.00, in comparison to the $995.00 price tag of the McCartney marvel, it is the perfect compromise for the frugal fashionista. And, given the fact that McCartney’s line is cruelty-free, both are constructed out of faux-leather; therefore, by snatching up the less costly of the two, you aren’t forsaking quality – rather, you are simply holding fast to an extra $946.00! Thanks to Net-A-Porter and Spiegel for the pictures. I really like the chain detailing on both of these bags! Really, some one would pay that much for the real one? Wow. The cheaper one looks great. I have to splurge on this one! I love Stella McCartney! I love the chain detailing & I think I actually prefer the Spiegel! Sorry but I'd go with Stella! I LOVe her! I like the cheap one! Amazing find - they really do look identical! I like the cheaper one best. Still thought, I am wanting to create a crocheted one just for me...with my own disign. Maybe some day. oh gosh! how do you always manage to find such cute items that look JUST like the original!! i'd go for the spiegel one! 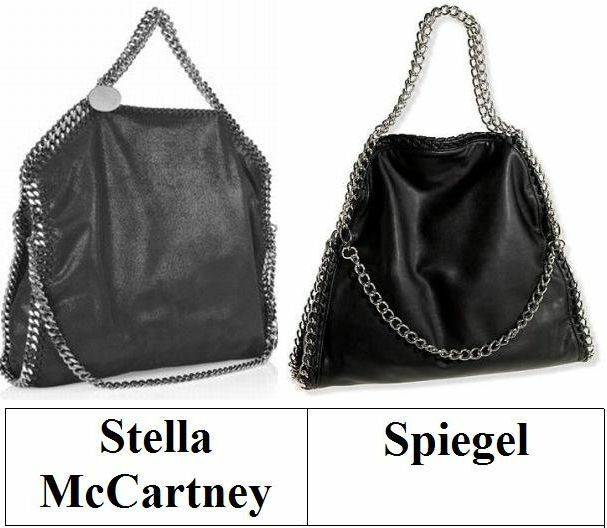 I love the bolder black of Spiegel's bag instead of the gunmetal gray that S. McCartney's bag seems to be. Hope you're having a great day, hon. I can't spend $1000 on a purse. That is against my nature. A tote? Maybe. Love your Sunday Steals! The Spiegel is an amazing buy, darling! You really do your research! Hope you are having a relaxing Sunday, E! $49 seems a lot better than $995 to me. Thanks for the tips. I love women's handbags!!!!!! Love both of them, but the glitter detail on the Stella is to die for.. I prefer the shape of the McCartney bag but I don't think I could spend that much on a bag! I would have to go for the less expensive version. I actually like the color better. Mmm, that style isn't really my thing, but it's a fabulous find nonetheless! And the fact that they're both faux-leather...I don't know why anyone would pick the Stella. wow I actually like them both :) love the chain detailing! I LOVE the Stella one -- so very chic. But the other is such a good alternative for the money! I really love how much effort you put into your posts for your readers!! You are wonderful. This might be the toughest choice yet! Love love love the color of the McCartney, but the price is outrageous! So tightwad it'll be for me! I have a similar bag from River Island and love it. It looks amazing. I love both of these, but definitely prefer the Stella McCartney one. Wow! if only I had the money. But well... till then, Spiegel one will have to do. Nice bag! Have a great week ahead, girl! Can't argue with any of these points you make here -- Spiegel sounds great! This one is hard... I'll go with Spiegel just because of the price! I love the chain detail on both bags and I am rolling with the cheaper version for sure. I have to say that I actually kind of love the Speigel one ... its funny sometimes that I find myself adoring the less expensive version ... works well for the wallet too! I think that the best women handbags are designed by Alexander McQueen. This fashion designer is famous in handbags industry.